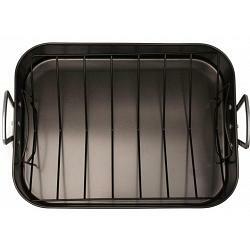 This non-stick roasting pan from Danesco measures 16.4 x 12.5 x 3 inches / 41.6 x 31.8 x 7.7cm and comes with a roasting / lifting rack. 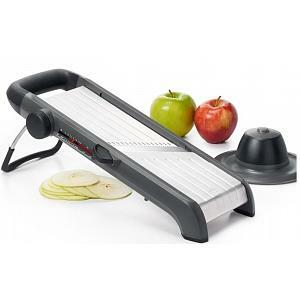 The pan is made from carbon steel with non-stick coating and is PFOA and PTFE free. 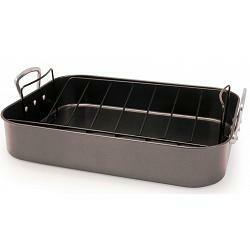 This roasting pan has a large capacity, making it ideal for cooking large poultry, roasts, vegetables, and much more. The pan features ergonomic stay-cool handles that provide you with a secure grip. The handles are riveted to the pan for added strength and safety. 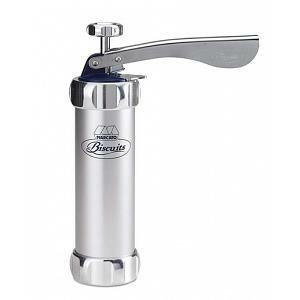 The roaster has a dripless rim to easily pour off juices and gravies. It comes with a V shaped roasting rack that elevates foods fro the pan's base, allowing fat to drain and hot air to circulate to allow even cooking. The rack is removable so you can use it for lifting poultry and roasts out of the pan and right onto your serving platter. 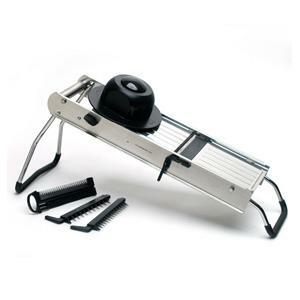 The roasting rack is oven safe to 220C / 450F and can accommodate birds of up to 25 pounds / 11.3kg.